Standing on the windswept cliff, the turbulent North Sea hundreds of feet below me and the stark ruins of Whitby Abbey looming behind me, I felt a little like the “French Lieutenant’s Woman” yearning to see the sails of the ship that would bring my lover back to me. Well, maybe not, but the setting was dripping with romance anyway. Stretching out behind me in the distance were wild heather clad moors while far below were the red tiled roofs of Whitby, the former home of rugged whalers and the fearless navigator and explorer Captain Cook. View from Whitby Abbey of St. Mary's church, Whitby and the North Sea below. was very nice but needed a roof. We descended from our dramatic perch on the bluff down the winding 199 step staircase into the center of Whitby, extremely thankful we were going down and not up. Whitby is now a major tourist destination instead of a whaling and seafaring port and it was packed. It seemed like everyone wanted to spend a day in this picturesque sea side town with its stunning coast line and I couldn’t blame them. It was probably going to be one of the last beautiful weekends of the summer. Decending the 199 stairs down into the town of Whitby. Great view of the harbor. Our lunch was supposed to be a treat—an included lunch of a thoroughly English meal of fish and the prerequisite side of thick sliced chips. The treat was that the fish was caught fresh that day, but the turn off was that the whole affair was deep fried and dripping in beef fat. (Sean was smart and ordered the grass plate special.) After wishing I’d skipped lunch, we crawled back into our big silver bus and lumbered out of town through the North York Moors National Park on to our next stop, Castle Howard. The moors were covered in a sea of deep purple heather that stretched endlessly on the horizon. Alternately dappled in the soft light and shade of billowing rain clouds, it made my heart hurt with its ethereal beauty. When Castle Howard first came into view the effect was stunning. Sitting regally on a far away knoll it overlooks lush lawns that gently slope down to a reed lined lake, reflecting the palatial estate on its tranquil surface. 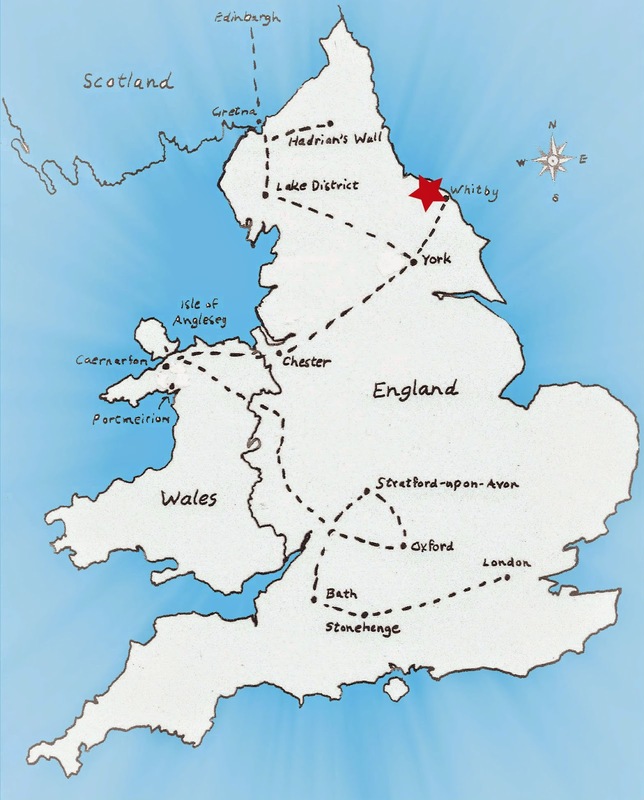 Only 15 miles outside of York, it has been the home of the Howard family for more than 300 years, once one of the wealthiest and most influential families in England. However, even though it is impressive on the outside, we didn’t get to see much of the interior. A devastating fire destroyed a large part of the 145 room estate in 1940 leaving a burned out shell. Fortunately enough of the opulent rooms were spared for us to enjoy, but I could still see evidence of blackened walls sadly marring the exquisite three story entry. Since only a small part of the home was open, I spent most of my time outside on the lovely grounds. Fortunately, the exterior of the Castle is intact and gives the illusion of being the stately home it once was. Besides being famous for having such prestigious owners as the Howards and for having been the setting for Brideshead Revisited, it also contains millions of dollars worth of priceless art from Roman statuary to a Michelangelo drawing. It was really worth making a special trip to see the Castle and Whitby Abbey. To me, just spending the day in the timeless beauty of Yorkshire made it absolutely worth it. I think I left my heart there. Suggested reading: “Lady Almina and the Real Downton Abbey” by Lady Carnevon (can-AR-von) A factual account of what it is like to live in a grand English manor both as an owner and servant. “The Other Queen” by Philippa Gregory. An historical novel about Mary Queen of Scots and her years of “house arrest” with the Howards (the 6th Earl of Shrewsbury). “All Creatures Great and Small” by James Herriot. Funny and heartwarming, it is the autobiography of a Yorkshire Veterinarian in the 1940's. A classic. Interesting piece, nicely written. Thank you for sharing. BEAUFORT, "QUEEN OF THE CAROLINA SEA ISLANDS"
10 TIPS ON HOW TO PACK LIGHT AND STILL DRESS LIKE A FASHIONISTA!